Hello! My name is Shelly. I moved to Massachusetts about a year ago but I don't know much about the state. My boyfriend of three years lives in Florida and he is coming to visit me for Christmas. I digress. Do you have any suggestions on any romantic places we can go and things we can do for the holiday season? Please? Boston feels especially romantic during December because all the festive holiday lights, Christmas decorations, and fun activities. Visiting romantic places with your boyfriend will give you two long-lasting benefits: 1) wonderful romantic memories, and 2) a great excuse to get to know Boston better. Part of what makes Boston romantic is that it's old - so in almost every neighborhood, you can see lots of beautiful historic buildings, cobblestone streets, narrow lanes and alleys, and small but wonderful restaurants. 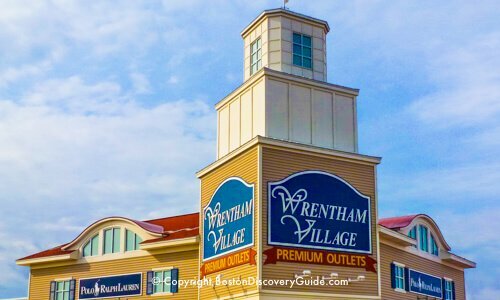 Take advantage of Boston's compact size by walking around and exploring the city together. December weather can feel crisp, so make sure your boyfriend brings a warm jacket, scarf, and gloves - if he even has these things in Florida. 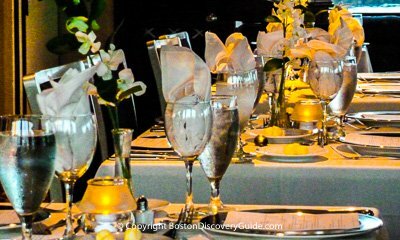 If your boyfriend will be here for New Year's Eve, don't miss the fireworks over Boston Harbor at midnight - perfect way to celebrate the beginning of a new year of romance! The following list includes eight suggestions for romantic places and things to do during the holiday season, plus a few other fun activities and events that will feel romantic when you're with someone special. 1. Share the Best View of Boston & Toast Your Future! What's more magical than a skyscraper-top view of city lights, sparkling like diamonds in all directions? Imagine a jazz trio playing softly in the background, and your favorite drink - perhaps something bubbly - raised in your hand as you toast your perfect holiday together. Gas lights along narrow cobblestone lanes filled with gorgeous Federal-period homes, Christmas wreaths on almost every door, and holiday lights sparkling everywhere you look - that's Beacon Hill at Christmas. Beacon Hill is one of Boston's oldest and most historic neighborhoods, located right across from Boston Common and the Public Garden. Don't miss picturesque Acorn Street, and the boutiques and cozy bakery/cafes along Charles Street. 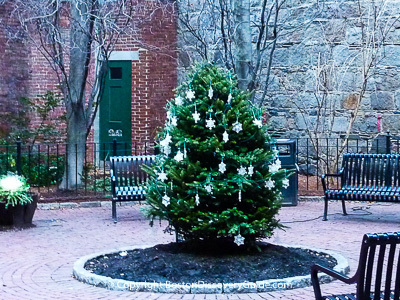 An especially romantic Beacon Hill spot is tiny Temple Street Park (shown in photo), tucked away behind the Massachusetts State House across from a Suffolk University Building on Temple Street. Resident doves nesting in the stone wall will coo romantically at you, and if you happen by when the tree is decorated, that's magical. You can get more ideas from this self-guided winter walking tour of Boston. A Christmas visit provides the perfect excuse to go see holiday lights, and this year, the biggest light show in town is Blink! at Faneuil Hall Marketplace. 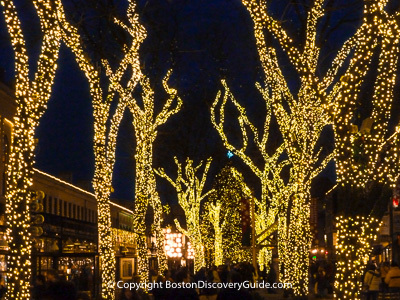 350,000 golden LED bulbs transform the huge trees throughout the market area into a forest of lights. But that's not all. Between 4:30pm and 10pm, a free light/sound show featuring music from the Boston Pops Holiday Pops concert and synchronized blinking lights entertains shoppers. Romantic? Not really...but it is magical, and if you're with someone you love, you'll see it through a romantic lens. 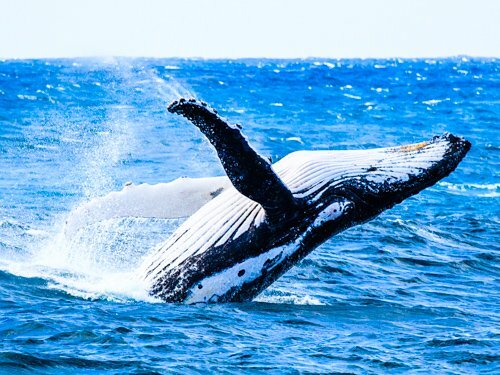 For a special romantic dinner accompanied by spectacular views, go on one of the dinner cruises offered by the Odyssey, modeled after a luxury ocean liner. You'll be served a gourmet dinner prepared on board by the talented chef. 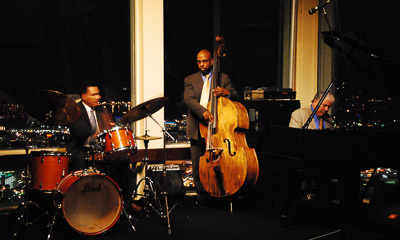 Sip Champagne, enjoy the live music, try out the dance floor, or just relax and watch the magical nighttime views of the city skyline and Harbor Islands. Now for some "only in Boston" kind of fun. 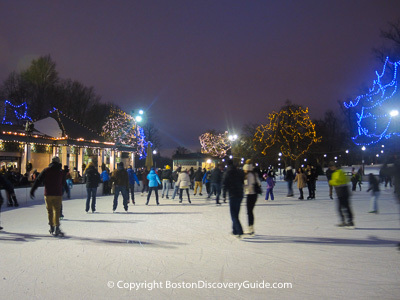 Head over to Boston Common's Frog Pond, rent skates, and go ice skating at night in the heart of the city, surrounded by brightly colored holiday lights shining from nearby trees. Afterwards, treat yourself to steaming cups of hot chocolate at the on-site snack bar. What makes a restaurant romantic? Candlelight, wonderful wine, sumptuous food, and a cozy ambiance help...but of course dining with the person you love is what really counts. 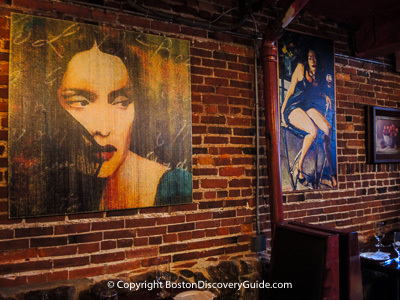 Grotto - Luxurious Italian favorites in a romantic setting tucked away on a side street behind the State House in Beacon Hill. 37 Bowdoin Street, 617-227-3434. Ma Maison - Romantic French bistro decor serving perfectly prepared French classics. 272 Cambridge St, Beacon Hill neighborhood, (617) 725-8855; www.mamaisonboston.com. Newbury Street Bistros - Stroll up and down Newbury Street in Back Bay, and check out the menus posted near the doors of the numerous cafes and restaurants, and choose the one you like best. OK, maybe Fenway Park isn't exactly romantic - but if your boyfriend is a baseball fan, he'll love you for taking him on a Fenway Park tour. 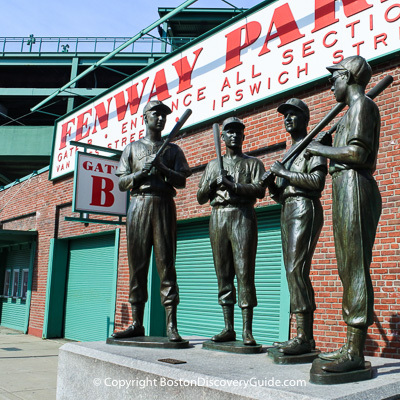 The entertaining tour guides tell you all about Fenway's history, legends, and legendary players, and give you a great behind-the-scenes tour. After the tour, go across the street to the Red Sox Souvenir Shop and buy him a t-shirt so that he'll think of you every time he wears it. Bonus if you're not a baseball fan: You won't actually have to sit through a game trying to look not bored. Alternately, if you both love sports, catch the Bruins or Celtics (or even a concert) at TD Garden, conveniently located next to North Station. 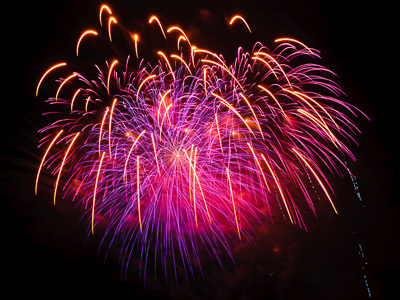 Welcome the New Year by watching fireworks at Copley Square at midnight. You can also enjoy all the free activities and performances at the day-long First Night celebration, Boston's biggest New Year's Eve event featuring shows put on by the local arts community and performers. As an alternative, many of the city's bars and restaurants host New Year's Eve parties, with tickets typically ranging from $50-$175/person. To stay close the the action, check out all the New Year's Eve hotel specials. 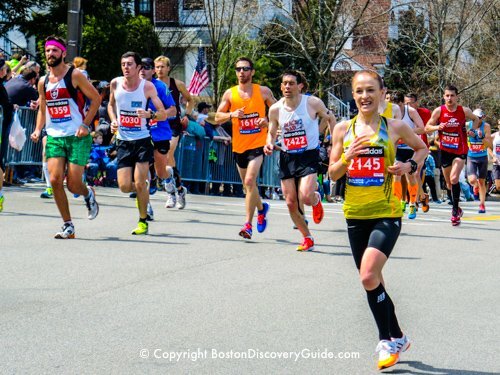 Boston Discovery Guide makes best efforts to update event information but we cannot guarantee the information as it may change without our knowledge. Please confirm details with event sponsors prior to attending.